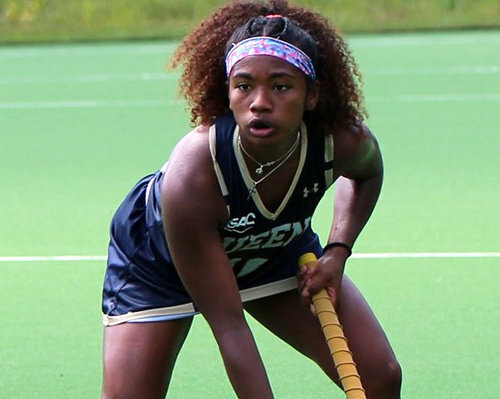 Maha Clarke and her Queens University of Charlotte Field Hockey teammates traveled to Limestone College to face the 10th-ranked Saints in South Atlantic Conference Carolinas play, falling 6-1. Queens now sits 7-5 on the year and 5-2 in league play, while Limestone improves to 9-3 on the season and 6-0 in conference play. Outshooting the Royals 8-2 in the opening half, the Saints were able to quickly jump out in front today. They scored three goals in the first five minutes of action and took the 3-0 lead into the halftime break. In the second, a Limestone goal in the 37th increased the Saints' lead to four, 4-0. A minute later, Queens' Mazvita Mtisi scored the Royals' lone goal of the day on from right in front of the cage. Millie Eaton-Jones was awarded the assist on the play. The Saints then closed the match scoring twice more to take the five-goal win. The Royals were outshot 17-11, putting eight shots on goal to Limestone's 14. Mtisi led Queens with six shots while Maya Forbes added two shots. Lanie Walsh returned to play today splitting time with Jet van den Berg in the cage. The pair recorded seven saves. Additionally, Carey Karl notched her third defensive save of the season. Thando Muchemenyi led Limestone with two goals. Cassidy Coates, Myrlin De Graaf, Kelly Diplock, and Carlota Corominas Cuen each added one goal as well. Susie Williams grabbed the win in goal after totaling six saves.